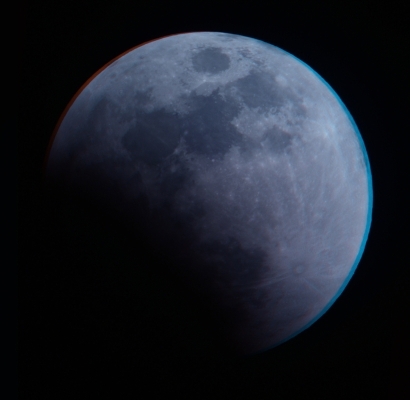 An anaglyph showing the Lunar Eclipse in 3D from coordinated observations by Leonardo Julio, Alejandro Tombolini and Adriana Fernández from Arenales y Agüero, Capital Federal, Argentina and Manuel Castillo at ESAC. The image in Argentina was captured with a Meade LX 90 telescope and an Olympus Evolt E-500 camera. The image from Majadahonda (Madrid) in Spain was captured using a 9 cm/F10 Matsukov-Cassegrain Telescope and a Canon400D camera. The timing of both observations was 01:56 UT 21 Febraury 2008. The images were selected from identifcation of the corresponding stereoscopic pair in a sequence covering all the shadow immersion. Alignment and scaling was performed using conventional image processing techniques.